The American Shakespeare Theatre, where actors like Katherine Hepburn once walked the boards. is no more. The theatre building in Stratford, Connecticut burned down over the weekend. The American Shakespeare Theatre opened in 1955 with a production of Shakespeare’s Julius Caesar. James Earl Jones, Christopher Plummer and many others appeared in productions over the years. The theatre also hosted the Ed Sullivan show when Bill Haley and the Comets first performed “Rock Around the Clock” for a national audience. The last regular season was in 1982. It featured a production of Hamlet with Christopher Walken in the lead role. Former town council member Beth Daponte said even though it was shuttered for decades, the theatre was a point of pride for lots of Stratford residents. “There was a history to that theatre. If you ever went in there you could see the absolute beauty of it. And you don’t see theatres like that anymore. And I’m afraid we’ll never see this theatre again, either,” Daponte said. Edward Goodrich, former chairman of the town’s arts commission, spent years trying to revitalize the theatre after it closed. He said he doesn’t want the fire to mark the end of Shakespeare in Stratford. The Connecticut Post reports Stratford’s fire marshal says it will be some time before the cause of the fire is identified. 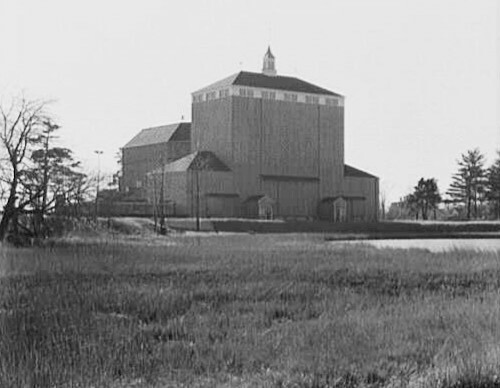 Photo of the American Shakespeare Theatre building in Stratford, CT, December 6th, 1955.